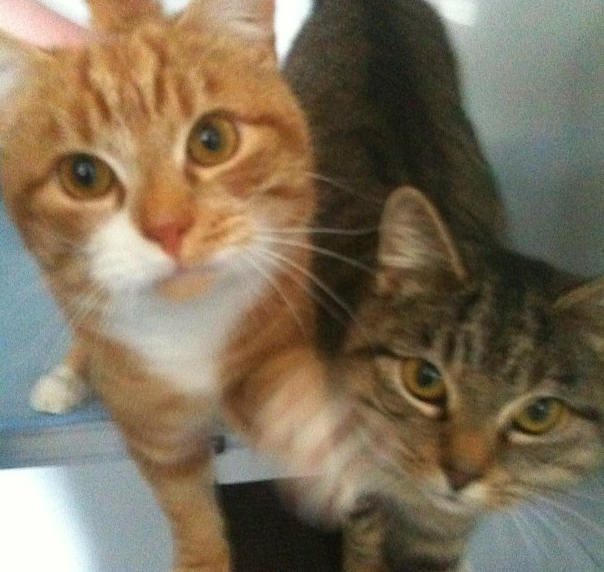 We were only looking for one to succeed the late Tommy Boy Murphy (named after a record label) but as soon as the orange one came into sight he was destined for our house and then the tabby appeared in the background and it turned out they came as a sibling pair. So it seemed right to seek out a pair of names fitting a boy & girl pair and I put out the call in social media. Names flowed in from all quarters. Even since the names have been decided, the Facebook thread has continued to flow, so it feels like the right thing to do to make all the great suggestions people have kindly offered available to future searchers of paired animal names. In the end we went for two halves of two pairs, Tango (from Tango & Cash) and Ziggy (from Ziggy & Stardust), the former the orange boy and the latter the grey girl. Tango & Ziggy.